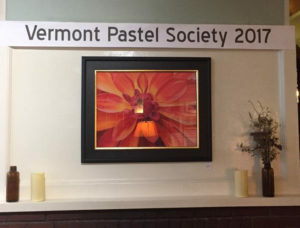 The Vermont Pastel Society is excited to announce the 2019 Annual Juried Show. This year, entry will be easier than ever via Online Juried Shows! Saturday, May 18 from 2-4pm. The gallery at White River Craft Center has space for up to 25 paintings and all VPS members are eligible to enter up to three pieces of artwork, however a maximum of two paintings per artist will be shown. Awards will be given for Best in Show ($300), 2nd Place ($200), 3rd Place($100), Pastel Painters Society of Cape Cod Award ($75) and the Mallory Lake Memorial Prize (Pastel Set). All VPS members are eligible to enter up to three pieces, however only two paintings per artist will be shown. Artwork must be original and completed after January 1, 2017. Paintings must not have been shown or won an award in previous VPS exhibitions. Artwork must be framed and ready to hang from wire. Paintings must be identical to accepted images. Paintings begun, worked on, or finished as part of a class or workshop must be 99.9% the work of the artist entering the show. The gallery receives a 25% commission on all artwork sold. VPS and the White River Craft Center will take all precautions in handling your work, but shall not be held liable for the loss or damage of any artwork exhibited. Artists must insure their own work and hang at their own risk. A non-refundable entry fee of $15 for VPS members enables the artist to submit up to 1 work and $5 each additional entry up to a maximum of 3 entries. Only two works per artist will be selected for exhibition. Payment should be made at OnlineJuried Shows. Thank you for offering your pastels for exhibition. We can’t wait to see what you’ve been creating! The 2018 Annual Vermont Pastel Society Juried Show was held at the Laumeister Art Center in Bennington, VT and the reception and awards ceremony took place on Saturday, September 29thfrom 2-4 p.m. The show will be open to the public September 29th to November 17th. 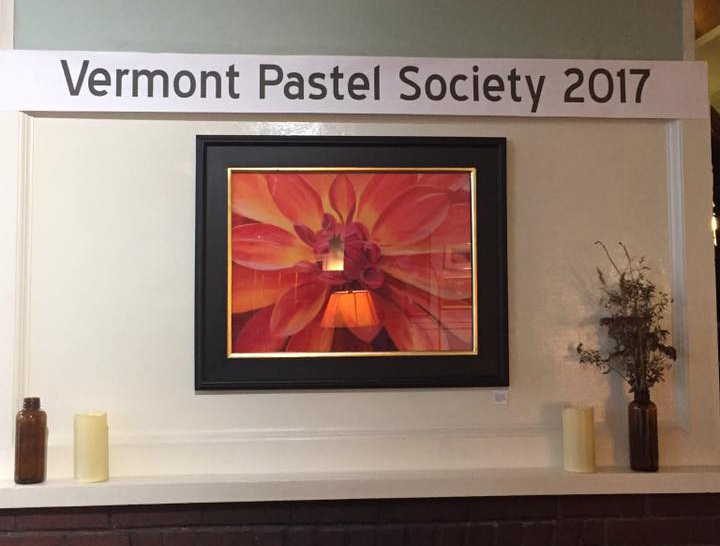 Congratulations to all of the participants in the Vermont Pastel Society’s 2018 Annual Show! You have skillfully displayed a wide range of techniques, compositional approaches, and subjects, showing the depth and possibilities of the medium. It is wonderful to see pastel used in these different ways, and with great success. There are many paintings in this show that deserve recognition for their experimentation, their fine command of the materials, or their sensitivity to mood, color, and mark. I encourage you all to keep up the good work and keep exploring the possibilities of pastel. This painting is fun, and engages both the viewer’s eye and mind. While the eye delights in the juxtaposition of colored shapes—no two the same, and yet expressing a compelling overall pattern—the mind is drawn into imagining the narrative of these figures and shadows. Technical, imaginative, and bold. A compelling combination of precise rendering and freedom. The texture of the support is used in a skillful way to add interest and a playful sense to a beautifully drawn subject. A narrow tonal range is used wonderfully here. The lively surface keeps the eye moving throughout the painting, and manages to create both a decorative flat composition, and a sense of space (albeit a crowded one!). A lovely rendering of light and space. The diversity of effective and confident mark-making creates atmosphere and texture within the scene. This small painting creates an architectural, moody atmosphere reminiscent of Mallory Lake’s work, even though it isn’t a landscape. Deceptively simple, there are unexpected risks taken in the composition and color choice that make it a pleasure. June 22-July 28, 2018: VPS Member Exhibition at The Chaffee Art Center, Rutland, VT.
“Abstract Spring” is such an appropriate title for this delicate expression of colorful bands of greens and blues offset by a delightful band of pink that brings to mind the feelings, the sights and even the smell of a landscape coming back to life. The 2017 Vermont Pastel Society juried show features 30 paintings by 21 artists from across vast distances of our VPS membership. There were several members in attendance at the reception on Friday, November 3rd from 5-7PM and your support is truly appreciated. The show will continue through December 27th. Two paintings have already sold, Autumn Back Road by Patti Braun and Lace and Clover by Kathrena Ravenhorst Adams. Congratulations to both of you! First, we would like to thank The Coolidge Hotel and Peggy Adams for providing the beautiful space to hang our beautiful work, for their promotional efforts, and for countless other acts of professionalism. Thank you to the selected jurors Claudia Post and Daryl Storrs who spent several days completing an incredibly difficult job of narrowing down 69 paintings by 36 different artists into just 30 final selections for our show. A big thank you to Doug Dawson for his equally difficult job of judging all of the fine artwork and narrowing his selection to just 5 top paintings. Thank you to the VPS volunteers who helped transport artwork for other members, offered to help hang work and brought refreshments for the event. Your dedication to your fellow members and this society are what make it truly exceptional. 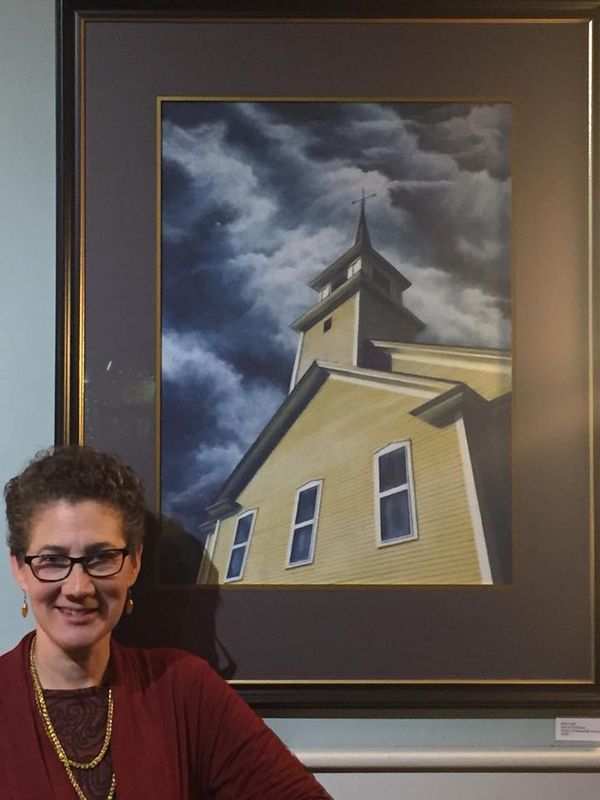 Finally, thank you to the Cape Cod Pastel Society for their continued support and Vermont pastel master, Mallory Lake, for one of her many sets of pastels as her bequest to the VPS, allowing us to establish an on-going Mallory Lake Pastel Award for future VPS juries shows. The following are the selected winners of the 2017 Vermont Pastel Society Juried Show and comments from the judge, Doug Dawson. Congratulations to the following members for being selected by a panel of jurors for the 2017 Vermont Pastel Society Exhibit at The Coolidge Hotel in White River Junction, Vermont. Thirty Paintings will be on display from September, 17th through December 28th with a reception on Friday, November 3rd from 5-7PM. We hope to see you there. I thank all of the participating members of VPS for the privilege of judging the members exhibition. This exhibit is filled to the brim with beautiful examples of what can be achieved today with our amazing, ages-old painting medium we proudly call pastel! The suffusion of atmospheric light superbly handled by this artist, permeating all of the elements of the painting, resulting in an overall glowing effect. 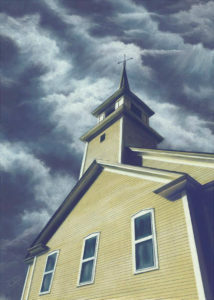 Hence, the masterfully handled atmospheric perspective creates luminosity throughout. My hat’s off for how this artist skillfully portrayed the depth, surface, and especially the transparency of the water near the distant shoreline in this well-organized composition. Sensitive handling of color saturation and value contribute to the absolutely stunning effect of this land/waterscape. The paint quality, mood and subject combine to make this a truly sensational painting! While not a traditional still life, this painting contains the essential elements that define this genre: close-up object or objects against a background, generally compressing space. What won me over is the manner in which this artist depicted a white “object” without using much if any pure white. This convincingly realistic representation is a lesson on color temperature in both the lights and darkened background. The unusual bird’s eye view, limited palette organized around the hue of its central object/subject, as well as the positioning and postures of the figure create a mysterious narrative, open to the viewer’s interpretation. Astute planning and competence are evident throughout. Here is a painting that deftly shows daring color that is refined and utilized to create an overall unified, coloristic effect. Everywhere the color changes and the transitions are seamless. The balance of light effect and sensational color is exemplary. I love the way the artist used a quantity of dark values in order to establish a convincingly glowing quality to the sunlight and sky in this painting. The diagonals of land and clouds in the design lead me into compositional depth to the luminous sun and its reflection – superbly painted! I find that there is a poetic quality to this image, a tonal quality that is very appealing. The elements that comprise the composition are painted in a distilled, more universal manner, the artist taking care not to overly depict any detail. I think that this imagery, even if derived from diverse locals, would comprise a stunning collection in series. This is a lovely composition, quite well-painted. The artist has a good understanding of composition and the use of tone to move the eye throughout the composition. I believe that this artist would further benefit from expert critique services, hence this award. Sometimes those opinions offered can provide insights that allow an artist to move forward; to transition from good painting to great painting. I love the sense of activity and movement in the clouds and reflected in the water — all in contrast with the stillness of the foreground’s beach and boats. Additionally, the artist creates great depth by use of a strong diagonal which is masterfully counterpointed by restful horizontals and near vertical elements of masts. Personally, as a juror and artist, I feel that strongly colored mats are not beneficial in public displays. Some shows and galleries advisee against their use, preferring white or off-white matting so as relate better to other works on display. For this reason, I am awarding this finelydone painting the framing award for a future work.